Ambassador Ramdin was elected to the post by the hemisphere’s foreign ministers gathered for the OAS General Assembly, in Fort Lauderdale, Florida, this past June 7. Ramdin succeeds the American diplomat Luigi Einaudi who concluded his five-year term earlier this week. 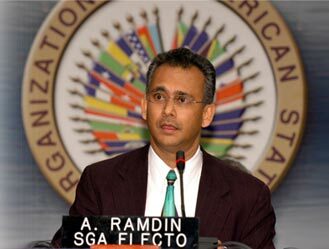 Ramdin, quien reemplaza al diplomático estadounidense Luigi Einaudi, fue elegido para ocupar esa posición por los cancilleres del hemisferio en la Asamblea General de la OEA realizada en Fort Lauderdale, Florida, el pasado 7 de junio. The OAS, as the premier forum in the Western Hemisphere for political dialogue and cooperation, now needs to underline its relevance by developing a forward-looking agenda that responds to changing political, social, economic and security realities in the various sub-regions of the Americas and the world.